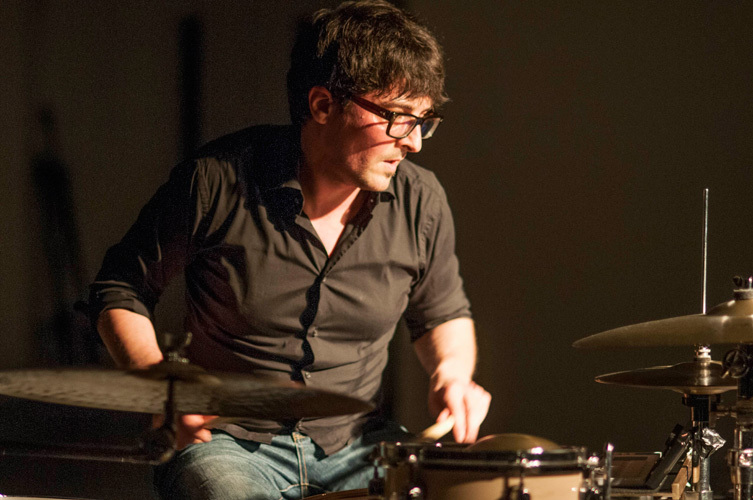 "Dovetailed" is Nicolas Field's solo project with drums and electronics. It's based around an amplified drum kit and a piece of software written in Supercollider. As a project, the solo including electronics, developed slowly but in a natural and organic way. Indeed, for several years now, he enjoys playing solo for the stimulation it provides and the countless possibilities it offers. His first performances date back to when he was in Amsterdam during his studies. Since, he has performed in Paris at the Le Corbusier Pavilion of the cité universitaire, at the Swiss Institute of Rome, at the JOLT Festival in Basel in 2011, in Geneva at the Batterie Festival organized by Eklekto in 2013, at the Antigel Festival, at the Météo Festival in Mulhouse, during the Fête de la musique in Geneva and at the Edge of Wrong Festival in South Africa in 2015. All sounds are generated as he plays the instrument. The software does an analysis (pitch, timbre, intensity) of the hits and then, plugs the information derived from that analysis into different kinds of synthesis methods that interact with each other. The system responds and interacts with the player and once he stops playing the electronics eventually die out.